This 15 oz. 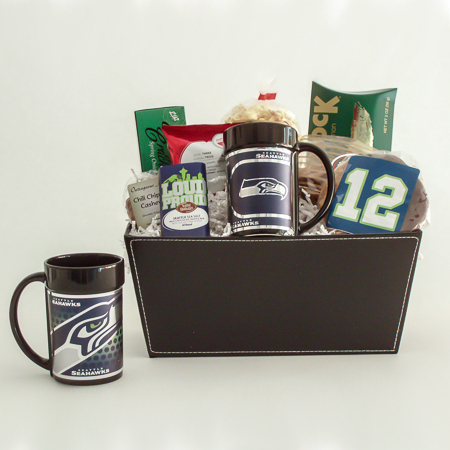 NFL Seahawks Mug is partnered with Portlock Smoked Salmon, Elki Crackers, Seattle Sinsations Pretzels, Outrageous Offerings Chipotle Cashews, Snoqualmie Candy Co. Caramel Corn, a Loud & Proud Seattle Chocolate Truffle Bar, a Chocolate Dipped Chocolate Chunk Gourmet Cookie and Seattle’s Best Coffee. A great Seahawks fan gift basket!